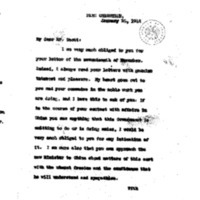 Woodrow Wilson thanks Charles E. Scott for his letters and asks for his input on U.S. affairs in China. I am very much obliged to you for your letter of the seventeenth of November. Indeed, I always read your letters with genuine interest and pleasure. My heart goes out to you and your comrades in the noble work you are doing, and I have this to ask of you: If in the course of your contact with affairs in China you see anything that this Government is comitting to do or is doing amiss, I would be very much obliged to you for any intimation of it. I am sure also that you can approach the new Minister to China about matters of this sort with the utmost freedom and the confidence that he will understand and sympathize. Wilson, Woodrow, 1856-1924, “Woodrow Wilson to Charles E. Scott,” 1914 January 10, WWP18275, First Year Wilson Papers, Woodrow Wilson Presidential Library & Museum, Staunton, Virginia.